Penchant Entertainment has announced that they have picked up all film and TV rights to the critically-acclaimed New York Times and Amazon best-selling book Hostage to the Devil: The Possession and Exorcism of Five Contemporary Americans by Father Malachi Martin with plans for film and series adaptation, each focusing on different elements from the source material. 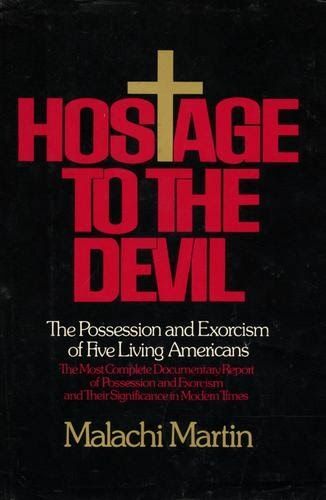 Originally published in 1976, Hostage to the Devil has sold well over a million copies worldwide and now, in eBook format, this chilling nonfiction account of possession and exorcism in modern America has been embraced by a whole new generation of readers, even inspiring a 2016 feature-length documentary. The multiple projects based on the book will be produced by Erin Eggers, Chase Hudson and Matthew Porter for Penchant. In Hostage to the Devil, Martin presents a chilling and thoroughly-researched analysis of demonic possession and the Rite of Exorcism, offering rich new details on the practice and its participants, never explored on screen. Presenting exorcism as an epic battle between priest and demon, Martin reveals how this profoundly personal battle can span a lifetime, exacting an enormous toll on the priest, who sacrifices a piece of his humanity each time he confronts these demonic forces. Malachi Martin, a former Jesuit priest, professor and theologian-turned-author of 15 novels and nonfiction books, was an acknowledged expert on and frequent critic of the Catholic Church. After moving to New York in 1965, Martin began to focus extensively on demonic Possession and assisted in nearly a dozen Exorcisms before beginning his work on Hostage to the Devil. The deal for the rights was brokered by The Gersh Agency and Lila Karpf of Lila Karpf Literary Management on behalf of the author’s estate and by Dan Stutz of Stutz Law Corp. on behalf of Penchant.